James Barry (1763-1806) is a brilliant anomaly in Britsh art history, but is also one of the most (if not the most) important Irish Neoclassical artists. I’ve wanted to choose one of his works for Painting of the Month for some time, but I have been torn between this one, a Self Portrait of 1803 in the National Gallery of Ireland, and his scene from King Lear at Tate Britain (1786-8). I finally settled on this, Jupiter Beguiled by Juno on Mount Ida, the one I haven’t seen in the flesh, because it is such a curious painting. As a young painter, Barry went to London to make his name, encouraged by his friend and fellow Irishman Edmund Burke. It was also Burke who convinced him to travel to France and Italy, which he did from 1765-1770. This time abroad would prove to be significant to Barry’s stylistic development, providing the classical inspiration he needed to realise his grand ideas in painting. Upon his return, he exhibited at the Royal Academy of Arts, and in 1782 he was made Professor of Painting. But after quarrelling with other artists and making ‘improper digressions’ in his lectures he was expelled in 1799. It is telling that he is the only Academician to have been ejected from the institution. Indeed, whenever Barry is written about his difficult personality is usually noted. The Encyclopædia Britannica of 1911 describes him as ‘…impulsive; sometimes morose, sometimes sociable and urbane.’ Although he had greatly admired the Academy’s President, Sir Joshua Reynolds, he criticised him for the number of society portraits he painted, believing that he was betraying his beliefs about the purpose of good art. Barry was a man of conviction. He stuck to his principals when it came to what he believed art should be and was prepared to fulfil them, no matter the cost to his reputation. His artistic visions were mainly derived from mythology and history. The subject here comes from Homer’s The Iliad, but Roman gods have replaced the Greek. 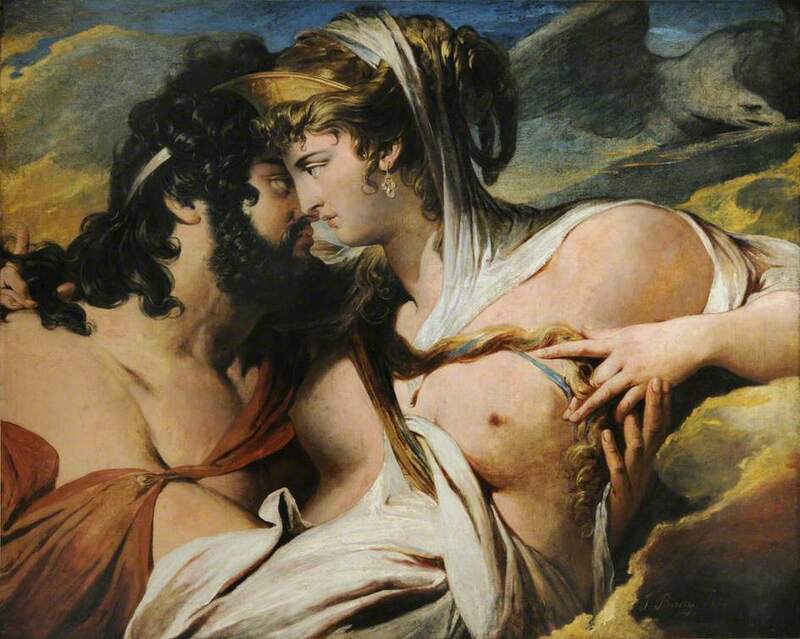 Jupiter, King of the Gods and God of sky and thunder, is seduced by Juno, his wife and the Goddess of marriage and childbirth, so that she may lull him to sleep and assist the Greeks in the Trojan war behind his back. With a little help from Venus, the Goddess of love and beauty, Juno succeeds in her mission, and on a golden cloud above Mount Ida, the great Jupiter is defeated by lust. The composition is cropped so that Juno dominates the canvas and she is placed higher than her partner, signifying her victory over him. The view of their heads and upper bodies is sufficient to tell us what is happening. Their faces are in profile, showing us the determined and bewitched look in Juno’s eye and the utter ensnarement Jupiter’s. She is beautiful, with a strong Roman nose, large bright eyes, pouty red lips and curls of golden hair. Jupiter is the epitome of burly handsomeness, with ringlets of black hair and a thick beard. He is broad-shouldered and muscular but totally overcome by desire for Juno, into whom he leans. The eagle, Jupiter’s spirit animal, is visible in the top right-hand corner bearing his thunderbolt, but he turns his head from the amorous scene at hand. While this painting demonstrates the creative strength of James Barry’s conceptions, it also shows his mastery of the emotional narrative behind the story. The interaction between the couple’s eyes and hands is exquisite. The look on Juno’s face is one of confidence and dominance, assured of the influence and control her beauty affords her. The forward tilt of her head and the parting of her lips hypnotises Jupiter, whose heavy eyes look up to her in obedience and submission. While his hands reach behind her back and under her drapery, Juno’s simultaneously play with her hair and his, twirling locks around her elegantly tapered fingers. Her left forefingers erotically frame her breast and the pinky finger hooks around Jupiter’s ring finger. These striking yet subtle gestures are what I think makes this painting so powerful. It is certainly why I am continually drawn to hands and fingers in paintings such as this, fascinated by how the slightest gesture can tell us what is going on and guide our eye around a composition. While James Barry may have had a ‘notoriously belligerent personality’, being regarded as rebellious and controversial by many of his peers, his proto-Romantic style had an undeniable influence over such artists as William Blake. His printmaking was particularly far-reaching, reproductions of his paintings translated extremely well in prints. Barry rarely deviated from his artistic purpose, creating ambitious artwork of grand subject matter conceived through his unique imaginative interpretations.